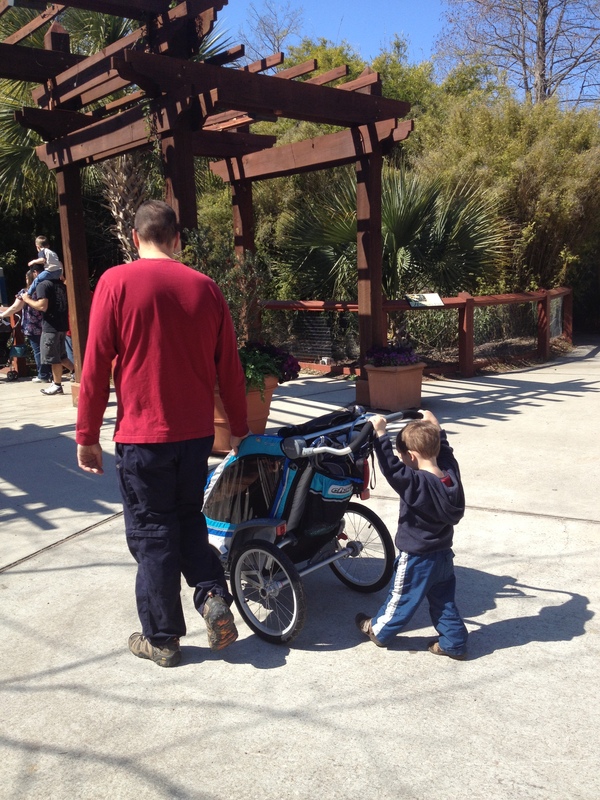 The Chinook in stroller mode (and toddler push mode…) at the Columbia Zoo. Our family has long since been fans of products from Chariot. Their commitment to family adventure is unprecedented, as for years this company has been providing families with ways to get everyone from here to there in just about any way imaginable – bike, run, walk, ski, etc. Our first experience with Chariot was with the Cabriolet. It’s a durable two-seater that has been on many a family escapade over the past 3 years. I even did a review on it way back when we first got it (found here). It wasn’t until we rented some bike trailers for C and his cousin on a family vacation in Michigan back in 2011 that I realized how much Chariot products stood out from their competition. So when the lovely ladies from Women’s Adventure asked if I’d be willing to review the latest urban offering from Chariot as part of their gear guide, I jumped at the chance. According to their website, the new Chariot Chinook is designed “for those seeking urban adventures…to accommodate busy families who want to go anywhere and do anything.” After testing out the Chinook for a wide variety of activities and terrains, I think it’s safe to say that their product description is accurate, as this product will not only fit all of your urban needs, but many of your more adventurous family endeavors as well! PACKABLE – At first glance it doesn’t seem like a bike trailer would be all that portable. But the Chinook easily fit in the trunk of our Toyota Camry, leaving plenty of room for adventure-goers and their gear in the back seat. 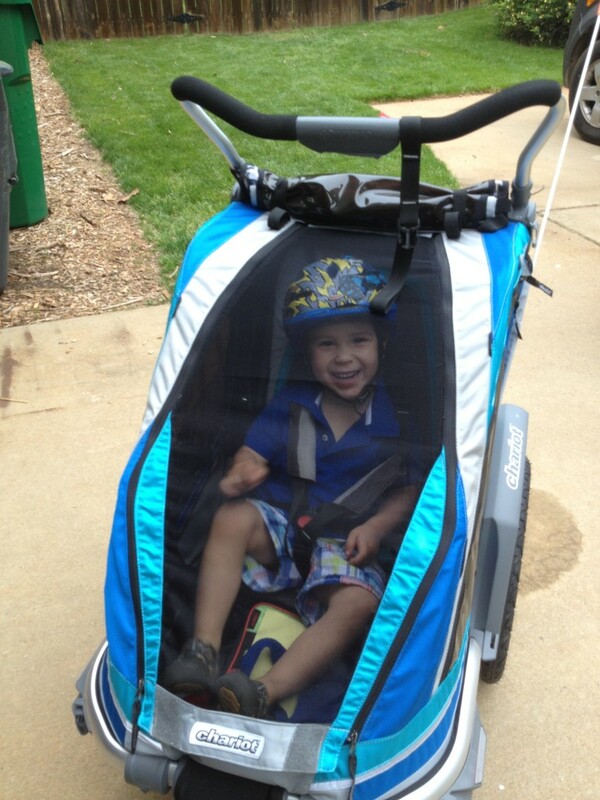 ADJUSTABLE HANDLE – One of the most annoying things about other jogging strollers that we’ve used is the handlebars. With a Daddy at 6’1″ and a Mommy at 5’5″, we aren’t usually fans of “one size fits all” varieties. The Chinook handlebars were adjustable with one quick click. The highest level was perfect for Daddy’s turn at the helm, while the bottom rung worked out great on my runs. SHOCKS – The silky smooth shocks made the Chinook very pleasant to use on even the bumpiest of terrain. On one bike ride in particular I was amazed that my 3 year old was able to finish his entire cup of water (no lid!) without any spills – that’s a feat he sometimes even has trouble with on his OWN two feet! STORAGE CAPACITY – The only thing we were a little bit disappointed about was the amount of storage on the Chinook. Our first outing using it as a stroller was at the Columbia Zoo – by the time we’d filled up the meshed compartment in the back with lunches/snacks, and stuffed some extra layers of clothing in the extra spaces on either side of my little guy, we were pretty much maxed out. Plenty of room for a day long outing on the greenway, but if you stop at the grocery store for a few items on the way back, your child might end up with a bag in his/her lap. To be fair, while our old Cabriolet did have a bigger storage area at the back of the carrier, many times I relied on the “extra” seat to stow items on errand days – so switching to a smaller storage area AND a single seat might have been too many variables for an unbiased comparison! MANUEVERABILITY – The Chinook has the turning radius of a sports car, which was made very evident as we navigated through throngs of people at a crowded zoo on that first outing. While I was initially afraid that using a “larger” stroller would be annoying, I was pleasantly surprised at how easy it was to maneuver between exhibits, especially the indoor ones in tight spaces. EASY TRANSITIONS – While I loved pretty much everything about the Chinook, the “Click n’Store” feature was by far my favorite. There are plenty of other multisport carriers out there, but most are designed with a “one sport at a time” mindset. But with the Chinook my little guy and I could easily bike to the farmer’s market, take off the bike conversion arm in seconds, and voila – we’re ready to stroll through the aisles! Like all Chariot products, I think the Chinook is a very well-designed piece of gear that will last your family for as long as you need it – and then some! It has features that will not only help active families stay active, but could very well get families on the bike/road/trail who would otherwise be at home on the couch! This review was written in conjunction with a gear guide for the summer issue of Women’s Adventure Magazine. So for more great gear options this summer, pick up the latest copy at the newsstand or click here. We have the Cougar and love it! Bought it anticipating a second child. So glad we splurged on this too, especially after seeing how cheap some of the other trailers looked. Thank goodness for REI dividends! We are going to get our monies worth out of this for sure! And I agree, these things are VERY well designed. I have been super impressed. some information from here and I will of course credit you as the reference. I just had my first Son, And I can not wait until We get our Chinook. And I bet my dog Moonbeam too. My cousin in Germany has a chariot and said its the best. I dunno how dumb a question this is, but is the Chinook usable as a “daily” stroller in indoor situations? I really like the idea of being able to bike somewhere and then switch from bike-trailer mode to stroller mode, and you mentioned doing this at the farmer’s market… but what about at a regular grocery store, or for that matter a bookstore? It just seems… huge. I have no intention of slowing my propensity to run up the side of a mountain, and the ability to use this as a jogging, biking, or hiking (!) stroller is grand. I’m just wondering if I’m gonna end up wishing for a compact stroller in addition to the Chinook! Thanks so much for the post. Chinook is the best for my baby.